Large stretches of Chult are coasts, and with Port Nyanzaru being a port, it is an obvious choice to reach distant parts of Chult by sailing along the coast rather than braving the jungles or the sluggish rivers – but ships are expensive, so how does explorers in Tomb of Annihilation get there? By hiring transport on a ship, and in the dingy taverns of Port Nyanzaru, there are captains who offer their services for a reasonable fee. I really like the concept of guides in Tomb of Annihilation. It may seem obvious, and yet it is so rarely done this well in wilderness adventures. Expanding upon the idea, thus allowing us to increase the scope of expeditions into the wilderness, I added Experts for Hire as mentioned in my previous post, and now I have Captains for hire. An assortment of captains, each with their own little kernel of a potential adventure, and a series of random events ranging from bad weather to weird and inexplicable phenomena. 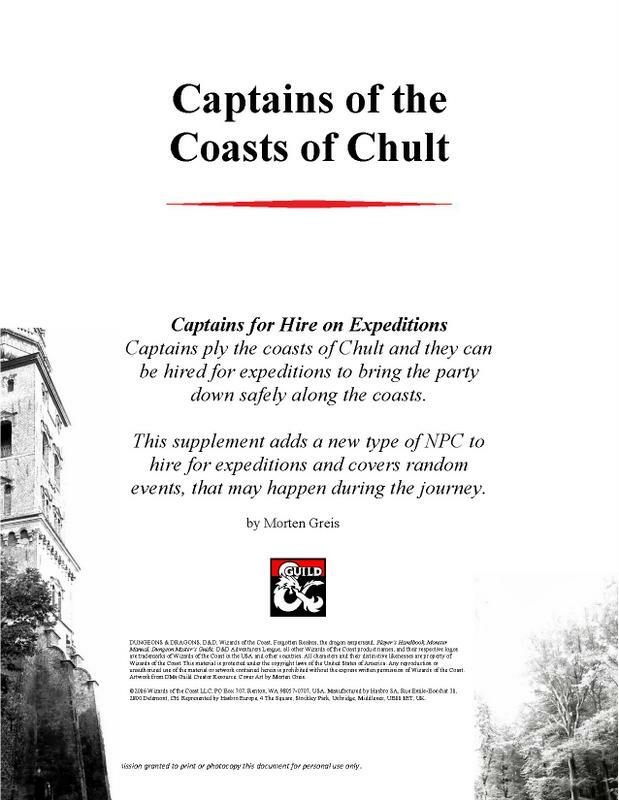 Captains of the Coasts of Chult can now be found at DM’s Guild. My previous Expedition Crew supplement was Experts of Chult, and I am considering adding a third one. I am running my own Tomb of Annihilation set in the Mystara setting, and there may be hidden a few references to that setting among the captains, but easter eggs seems to a part of D&D 5th edition, so it is merely keeping with the style.